The harness is attached to the patient's head, and straps are attached to wrists and ankles simultaneously as illustrated by this diagram. Harnesses are connected to the SCIO. The SCIO is connected to the computer. Harnesses may be attached to the patient at the area of the condition being targeted. 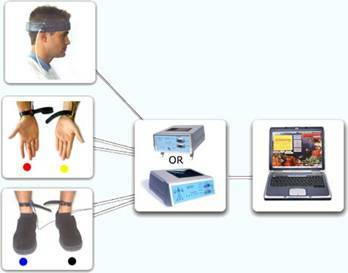 The client may also be scanned using probes, mats and other accessories which are connected to the SCIO. * The SCIO is the newest version the EPFX. It is faster and has an additional computer chip that allows for multiple therapies to be running continuously throughout the session.